Even one minor mistake in an otherwise well-designed piping system can cause serious, high-maintenance problems — such as water hammer — that can damage pumps and other components. At DFT®, we’ve seen best-case scenarios, and we’ve seen catastrophes, especially involving the installation and maintenance of check valves. 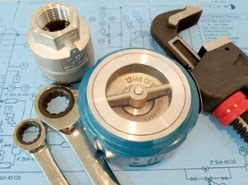 To help understand the many factors that go into a well-functioning piping system and to prevent water hammer and related issues before they become serious, time-consuming problems, we’ve created a comprehensive webinar, “Solutions to Your Check Valve Problems — Important Valve Installation and Piping Design Guidelines.” This presentation will review installation, maintenance, and piping design tips, as well as key guidelines to keep in mind to ensure the most efficient installation and use of check valves. The upcoming webinar will explain the basics of piping design and the fundamentals of valve sizing, with an emphasis on sizing check valves for specific application conditions, rather than selecting a valve based solely on line size. Speaker —Arie Bregman, vice president and general manager of DFT® Inc. A 35-year industry veteran, Bregman is active in the U.S. Valve Manufacturers Association (VMA), serving on the group’s education, training, and technical committees. He also is a member of the VMA Board of Directors. Bregman holds a Master of Science degree in mechanical engineering from Worcester Polytechnic Institute in Worcester, Mass. DFT® has solutions for your check valve problems. Register for our webinar today! Contact DFT® Valves for more information!